The misogynist regime ruling Iran preserves its grips on power by relying on two pillars of domestic repression and export of terrorism and fundamentalism abroad. Since the beginning of its rule, suppression of women under the pretext of mal-veiling has always been a great part of domestic repression. However, thanks to the Iranian women’s defiance of such forcible impositions and standing for their right to choose their own clothing, the issue of “veiling and virtue” has turned into a political and security problem for the regime. Suppression of women under the pretext of mandatory veil was the clerical regime’s first step from the outset, when it seized power in 1979. In the course of the past 37 years, however, the organization of the agencies in charge of such suppression has expanded. In April 2010, the mullahs’ parliament (Majlis) adopted a bill entitled, “the law on expansion of practical solutions for virtue and veiling” and defined the responsibilities of at least 26 government agencies with regards to enforcing the mandatory veil. The solutions include “revival of the tradition of enjoining virtue and forbidding vice with regards to virtue and veiling.” This means engagement of unofficial operatives to harass women on the streets. In October 2014, this led to organized acid attacks and stabbing of women by such unofficial gangs. The 26 agencies in charge of enforcing the mandatory veil and their responsibilities in this regard are briefly listed in this pamphlet. The Parliament is responsible to institutionalize violations of women’s rights through legislations. In 2014, the bill passed to support those who “enjoin good and forbid evil,” led to an extensive wave of acid attacks on women. Revision of laws on punishment of gangs who promote an anti-Hijab culture. Setting up special judiciary branches and prosecution offices in cities throughout the country to deal with those who do not observe the veil. On January 11, 2016, the public relations of the Justice Department of Mazandaran Province announced that 14,183 people had been summoned to the guidance units and judiciary branches of the province in the course of one month and another 1,029 had been fined over the phone. In the final days of June 2016, the General Prosecutor’s Office of Torghabe-Shandiz announced that the city would control and prevent entry of women riding bicycles and they will be dealt with. The Ministry of Interior has 11 defined duties and is charged with monitoring all public and private agencies, organizations, offices and institutes to make sure they observe the rules regarding the compulsory veil. Declaring the SSF’s views on the activities of certain sectors that could promote vice and preventing the activities of businesses that do not comply with the laws on Hijab. In January 2016, Tehran’s SSF Commander Hossein Sajedi-Nia announced the formation of a Special Children and Teenagers’ Police force. In July 2016, the SSF Commander in Gilan Province announced launching of a new operational plan to control all the beaches in northern Iran. He said 140 points across the northern coast will be monitored by the SFF’s official personnel, plainclothes agents and (the paramilitary) Bassij forces. The number of street patrols were added in the same month. Head of Justice Department of Isfahan said they had allocated vehicles to the “sisters” who promote virture and forbid evil. Security forces found another excuse for clamping down on public in the month of Ramadan. Commander of the SSF in Hamedan Province declared that special Ramadan patrols had began their work. On June 3, 2016, he announced that eight so-called stations of virtue and veiling and moral security patrols had started their work. He added that all police stations will also monitor observation of fasting in the month of Ramadan and those who violate it. The paramilitary Bassij Force has been given six specific duties to control all locations and interfere in every aspect of people’s private lives. The Bassij has branches in schools, universities, as well as associations of physicians, engineers, university professors, government employees and women. The Bassij Force is especially tasked to have overt and covert supervision in society and communities such as schools, universities, mosques and government offices. Bassij forces are often chosen from among the most uneducated and uninformed layers of society and are given extreme powers to act as law enforcement agents of the judiciary and the State Security Force. Bassij has trained 52,000 people as “experts on virtue and veil” to be present in schools and universities. The women’s community Bassij organization is one of the 22 sectors of the Bassij. These women are instrumental in oppression, harassment and arrest of women activists. Ensuring gender segregation by creating separate parks and sports centers and taxis for women. The Staff for the Revival of “Enjoining Good and Forbidding Evil” has 11 specific duties. The Staff works through unofficial forces to clamp down on women and spy on them. In the mullahs’ culture, such virtue is summarized in restricting women and forcing them to wear the veil (Hijab). Women are punished if they do not abide by the Hijab. Some of the functions of the Revival Staff are as follows. The Staff encourages people to suppress women in offices and public places under the pretext of “enjoining good and forbidding evil.” The Staff is also obliged to identify women’s associations, unions, organizations, and groups and save their information in a data bank. Dealing with and preventing the activities of internet institutes that have access to unlawful websites. The Organization of Radio and Television has 31 tasks, for example, production of children’s programs in line with the mullahs’ misogynist views, continuous supervision of commercial advertisements to conform with the official standards of mandatory veil for women, devising specific policies on the style of clothes and make-up used by artists, anchorwomen and moderators, and adoption of disciplinary policies for actresses working with the radio and television. This agency also has to prevent promotion, support and honoring of famous female moderators and actresses who do not observe the official dresscode when they appear in public. The Organization of Islamic Propaganda has 12 duties in the field of advertising and public relations. They mainly produce humiliating ads on women’s veiling and post them in the waiting lounges at the airports, railroad stations, bus terminals, city squares and intersections, etc. Giving serious warning to women who do not observe the virtue and veiling in sports arenas. In the latest Volleyball World League Tournaments (July 1-3, 2016) in Tehran, the Iranian regime prohibited sale of tickets to women. Holding school principals accountable if students do not observe the mandatory veil. Preparing and submitting an annual report on the status of virtue and veiling to the Supreme Council of Cultural Revolution. The Ministry of Labor and Social Affairs with five duties is responsible to provide whatever means necessary to implement gender segregation in society and make sure that women wear the veil in co-educational classes and training courses by overseeing them. Giving warnings if necessary to the affiliates of foreign embassies to observe the hijab rules. The Ministry of Economy and Finance has been assigned with four tasks which include banning import of dolls, dummies and posters which promote an anti-Hijab culture, setting special customs tariff on women’s clothing and make-up, etc. Overseeing observation of Hijab in foreign organizations such as the UNESCO, UNICEF, WHO, etc. and harmonizing the staffs’ uniforms in the above centers. The Ministry of Housing and Urban Construction has nine specific duties in repressing women. This ministry is obliged to design houses in such a way that pedestrians would not be able to see inside the houses. The ministry must also consider a residential unit for the state-backed mullahs in large residential complexes, so that they could closely monitor and interfere in the lives of the residents. The Ministry of Roads and Transportation has seven duties while promoting the compulsory veil by refusing to recruit mal-veiled women and turning in the violators who do not observe the veil to the State Security Force and the Judiciary. The Management and Planning Organization has nine duties. This organization is responsible for facilitating and generating funds for other organs to implement plans which prevent employment of women under the pretext of observation of the veil (Hijab). The Welfare Organization has five specific duties. Women who do not observe the mullahs’ desired Hijab, are identified and convicted. This organization has to work with these individuals during their prison terms and rehabilitation to compel them to conform with the regime’s fundamentalist beliefs. The organization is also tasked to prioritize the convicts, and cooperate with the Prisons Organization for rehabilitation of the convicts. This organization also has to promote the culture of compulsory veil in all the places it controls and even in the kindergartens and childcare centers. Center of Women and Family Affairs has six duties which are basically summarized in promoting the clerical regime’s desired dresscode. The Youths Organization in every country is in charge of providing awareness and recreation for the youths. In Iran, however, they are in charge of clamping down on youths. The Youths Organization has 14 duties in line with enforcing the mandatory veil. This organization must work out and propose effective methods to enforce the mandatory veil and devise rules for implementing them. 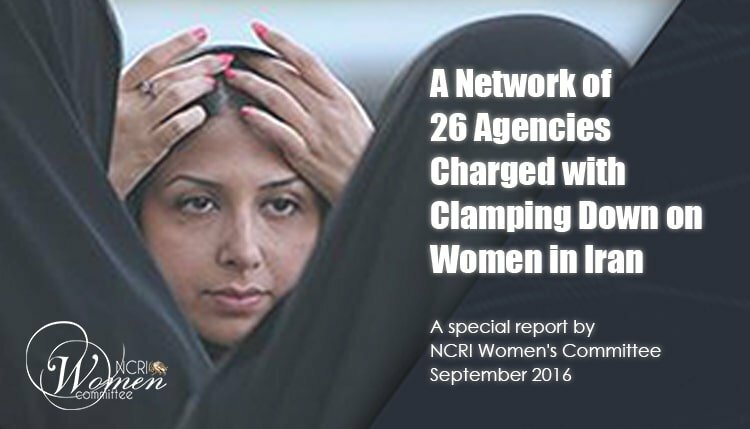 The 26 organizations and government departments listed above form a network assigned to suppression of Iranian women. However, this is not the entire system. There is another body called the Supreme Council of Cultural Revolution (SCCR) presided by the regime’s president. This institution was founded after the 1979 Revolution in Iran on Khomeini’s direct order. The council has a significant role in policy making and drafting the rules. It also governs other agencies. Outlining the necessary rules and regulations to prevent import of goods that do not comply with the culture of virtue and veiling. As these measures have not been sufficient in compelling women to comply with the compulsory veil, the regime’s President Rouhani ordered the Ministry of Interior to – collaborate with the Social Council of the City of Tehran to – prepare a comprehensive report on the situation of virtue in the country and submit it to the Supreme Council of Cultural Revolution. The aim of this report would be to study and work out new solutions for imposing the mandatory veil. On June 20, 2016, the official IRNA news agency reported that a new committee had begun its work in the parliament. The Women and Family’s Committee to Enjoin Good and Forbid Evil has been formed to institutionalize the law on enjoining good and forbidding evil and to implement the law for supporting those who enjoin good and forbid evil. The state-run Tabnak website also reported on June 23, 2016, the formation of a working group on Virtue and Veiling at pharmaceutical units of universities.